Dramedy of a native New York married couple who splits up in an attempt to rediscover their sanity. A comedy about love, marriage, reconciliation and other acts of courage. Sally Cramer: Will you give him back his whistle! 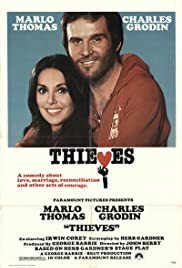 Both Marlo Thomas and Charles Grodin play a socially dysfunctional couple who are basically INSANE!!.. (Her insanity being more transparent) This is a characteristic that rules their lives...Bellvue cannot take care of them and they cannot take care themselves..Marlo Thomas is 39 years old before she realizes her father is deaf!! !...They love New York more than anything else...New York doesn't necessarily like them...The future is mapped out and it is pretty much established that everyone in the movie will wind up fighting a losing battle!!! The acting in this movie is extremely good! !...I love this twisted plot which borders on no plot at all...The same director as "1000 Clowns" has a knack for making an extremely horrible situation funny, I mean very funny! !...As he does in "Thieves"....Thieves is the definition of comedy, the situation for the characters involved is catastrophic, yet anyone who sits backs and observes will find these messed up people hilarious!! !I liked this movie, and I love dialogue and plots that are unconventional! !...I give this movie 4 out of 5 stars!! !